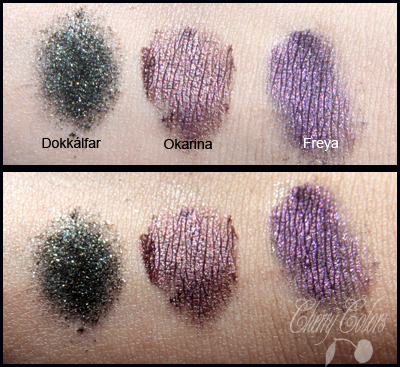 Quick Swatch; Three Fyrinnae eyeshadows (Dokkalfar, Freya, Okarina) - Cherry Colors - Cosmetics Heaven! Today I got some more Fyrinnae samples (now I have 14!). They are Dokkalfar, Freya and Okarina. Next time I will show you better swatches, of them, one by one.. This is just a very quick picture. I'm madly in love with Freya.. it's just.. superb!